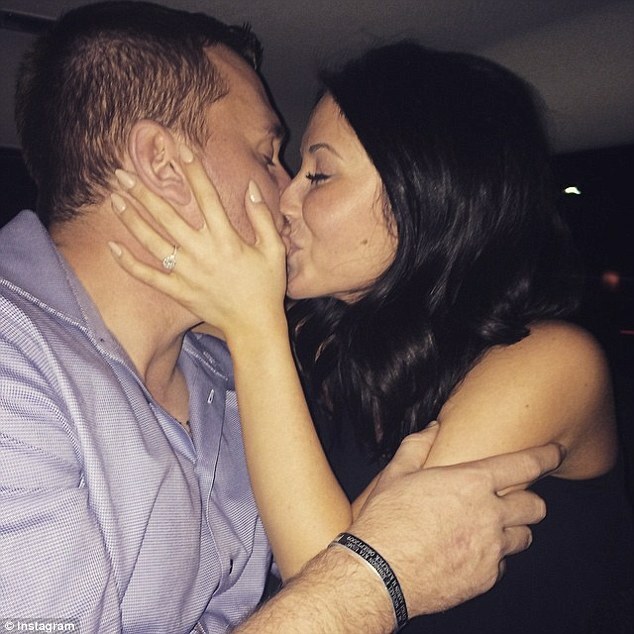 Sarah Palin’s daughter Bristol is engaged! The 24-year-old mother of one is set to marry Sgt. Dakota Meyer, a 26-year-old Kentucky-born U.S. Marine vet and war hero who received the Medal of Honor in 2009. According to TMZ, the two announced the news on social media on Saturday. “I’m definitely the luckiest guy ever to be able to spend the rest of my life with @bsmp2 #shesaidyes,” Meyer said on Instagram, alongside a photo of the two. “Truly the luckiest girl in the world, cannot wait to marry this man!!! !” Bristol wrote in her own post, which included a photo of the two kissing. She also shared a picture of her wearing what appears to be a halo, cushion-cut diamond engagement ring. This will mark the first marriage for both. Bristol was previously engaged to Levi Johnston, the father of her 6-year-old son Tripp, between 2008, when her mother was running for vice president, and 2009. Bristol shared a photo of herself with her boy and Meyer several days ago. It is unclear when she and her fiancé began dating. They had not confirmed a relationship publicly until their engagement. Meyer first shared a photo of Bristol, standing with him and her mother, during a trip to Las Vegas in January. Sarah posted the same pic on her Facebook page but gave no indication the Marine vet and her daughter were dating. Meyer had last month posted a happy birthday message for Sarah. In 2009, Meyer, then a 21-year-old corporal, was deployed in Afghanistan. While on patrol with fellow U.S. troops and Afghan security forces, he and his team were attacked by Taliban fighters. As they came under enemy fire for six hours, he defied orders and saved the lives of 36 of his comrades and retrieved the bodies of those killed. He was wounded by shrapnel. In 2011, he become the first living Marine to receive the Medal of Honor since the Vietnam War. U.S. President Barack Obama presented him with the award. Meyer has also been deployed to Iraq. He is currently in the Marine Corps Inactive Ready Reserve. Bristol shared a photo of their message to him. He has not commented. This poor guy must have suffered a brain injury along with all of his other problems. That’s the only reason that I can think of of why he would get involved with Bristol and her whack job family. Oh, and to top it all off, they met on a reality show. Doesn’t everybody? How romantic. Obviously this young man is suffering from some yet unknown disorder if he is willingly marrying into that family. Still, she had to rush right out and announce it to the first media source willing to listen. Sounds as if she has the same personality as her mother. Mrs. can do no wrong, oh hurry up and look at me, power abusing media hoe. The Palins, another reason to not forgive the North Vietnamese for returning John McCain. One suspects that he may, in fact, be a Manchurian Candidate .